Few things are as trustworthy as a friend’s recommendation. Or…maybe not. I can’t tell you the amount of TV shows that I’ve been told to check out, only to wonder what the hell my “friends” were thinking. And don’t get me started on music- Frank Zappa said it best when he remarked “talking about music is like dancing about architecture”. You know what you like, and no one’s insistence that Kanye’s new album is next level art is gonna change your mind. Me? I like Kanye. But I don’t trust friends’ music recommendations. It just isn’t possible, I don’t think, to recommend music like you’d do with a film. Music is complicated. Candy though, that’s a different story. It’s very rare a friend loves something, recommends it, and then I don’t like it. Because…I like a lot of candy and it’s gotta be pretty bad for me to straight up “not like” it. Lots of things are meh, middle of the road whatever, but I still can understand why said friend likes it. Which brings me to today. My dude Richard is from England, so of course we got to talking about candies. His favorite? 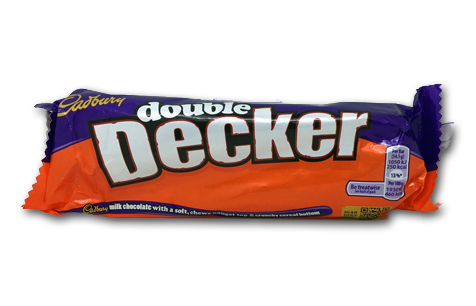 The Cadbury Double Decker. So while he was back home recently visiting his mum (they’re not called moms over there), he brought one back for me. The thing travelled thousands of miles, so it was no surprise to me that it wasn’t in its finest form upon delivery. Did I care? No. It’s kind of fascinating looking like this right? On top of the bar was a note from Richard telling me to put half in the freezer, as that’s the way he eats them. Ignoring that and feeling much bravado, I jumped right in. 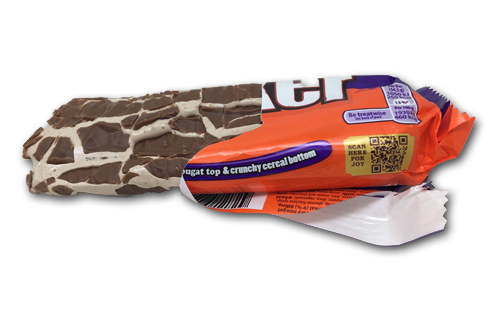 The composition of this bar is a layer of nougat on top of a layer of frosted flakes-like cereal, covered in milk chocolate. And the taste? Meh. It was fine. I’m not the biggest nougat fan, but I thought it tasted pretty good. 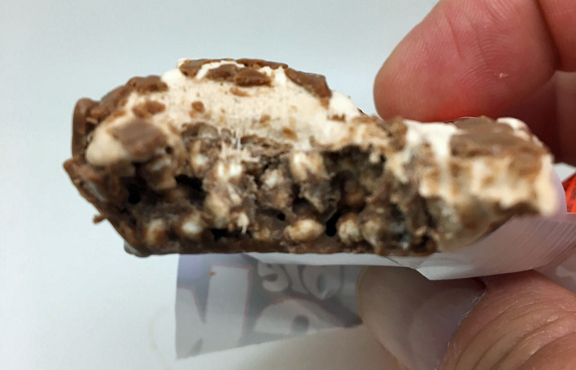 The soft marshmallow-like quality of the nougat wasn’t quite doing it for me, but again, it was pleasant enough. At that point, I thought it wise to heed Richard’s note, so I stuck the rest in the freezer. Later that night, I grabbed it. And wow…what a difference a few degrees make. Absolutely delicious, this thing had me spellbound. What happens is that the nougat turns hard-for a minute. Then it very quickly starts dissolving into a creamy, familiar soft layer of goo. Meanwhile, the cereal is providing a second source of crunch, one that stays consistent. The excellent chocolate of course is delicious, and ties the whole thing together. Honestly, I was amazed at the difference the freezer made. Every bite (and I ate the whole thing) was a really interesting, dare I say “exciting” mini adventure. It shot up the charts to something I’d absolutely buy again. Friends. Without them, we’d be sitting around like idiots eating Double Decker bars at room temperature-and that’s a world I don’t want to live in. Buy a few for yourself, and don’t forget to put them in the freezer!